How do you become a billionaire? Some argue there is a magic formula : start a business in a monopoly-ripe industry, expand as quickly as possible, and maintain a high percentage of control over your company stock. That certainly sounds like how Mark Zuckerberg and Bill Gates did it. 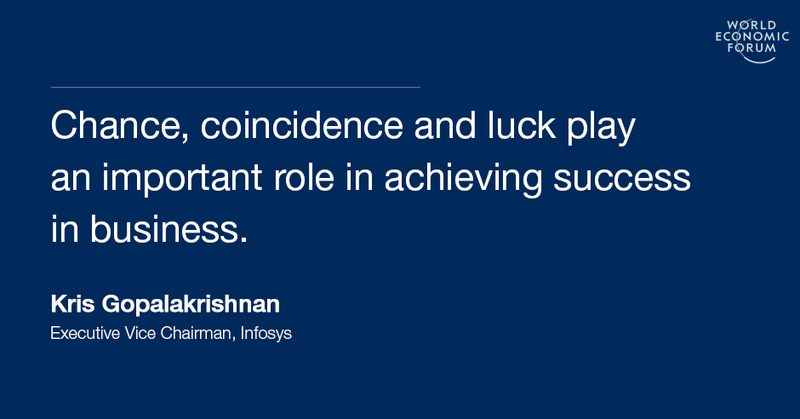 But Kris Gopalakrishnan, a billionaire co-founder of IT giant Infosys, claims the road to riches can essentially come down to two much more mundane aspects: chance, and a pat on the back when you need it most. That at least is how he explains his success. Gopalakrishnan's lesson to others is therefore to let life take you where it takes you, and to focus on helping others who are struggling. Today, Infosys is an IT outsourcing giant, with revenues of almost $10 billion, and a worldwide employee base of almost 200,000 people. But in 1981, it was a tiny start-up that only survived the first few years of its existence because its founders worked virtually for free, and the one computer it possessed was leased out to other ventures during the most productive hours of the day. So what made Gopalakrishnan part of this start-up, and what made this start-up the behemoth it is today? As a high-school graduate, Gopalakrishnan had initially hoped to become a doctor instead of an engineer. Sadly, he had to let go of that pursuit when he failed the entry exam. When I interviewed him (as part of the research for my book, Before I Was CEO ) he told me he considered it the greatest failure of his life, a huge personal disappointment for his parents, and a setback he could not have bounced back from purely on his own. Surprisingly, at the end of the application process, Gopalakrishnan faced the same situation: although he passed the written exam, his limited knowledge of English meant he failed the oral interview and wasn’t admitted to the university of his choice. But it didn’t matter as much to him this time. He carved out a plan B: a Master’s degree in Physics at the Indian Institute of Technology. It might not have been his preferred choice, he explained, but it opened the door to co-founding one of the biggest Indian companies of our time: Infosys. He certainly was. Gopalakrishnan started studying computer science in 1977, the same year Steve Jobs, Steve Wozniak and Ronald Wayne founded Apple. He was working in his first job, at Patni Computer Systems, in 1980, when Bill Gates won the IBM contract that led to the development of MS-DOS, and eventually, Microsoft Windows. But then, things finally started to work out. In 1990 the founders resisted a buy-out. In 1993 they successfully brought their company to the stock market. In the following years, the internet happened, and Infosys grew at a breakneck speed. By 2000, Infosys was one of the 20 largest companies listed on NASDAQ. By then, the company was steady enough to get through the dot-com crash relatively unscathed. Looking back at his success and how it came about, Gopalakrishnan takes away two important things: one, you shouldn’t brag about success, as much of it is due to chance. And two, if you want to have a lasting impact, give others a pat on the back. He puts his own learning into practice. When I wrote to him this summer, he told me he had recently retired from Infosys. “I am now helping start-ups and have set up an incubator called Axilor,” he wrote. As you build your career, how will you help others along the way?